Quangsheng are the only volume iron handplane manufacturer to use water hardening carbon steel for their cutting irons. Water hardening steels are usually associated with tools from Japan, they are purer than the oil or air hardening varieties. From a metalworking perspective T10 steel is less predictable to work with than O1 for example, but it can be tempered harder without losing it's toughness and it takes a supremely fine edge. 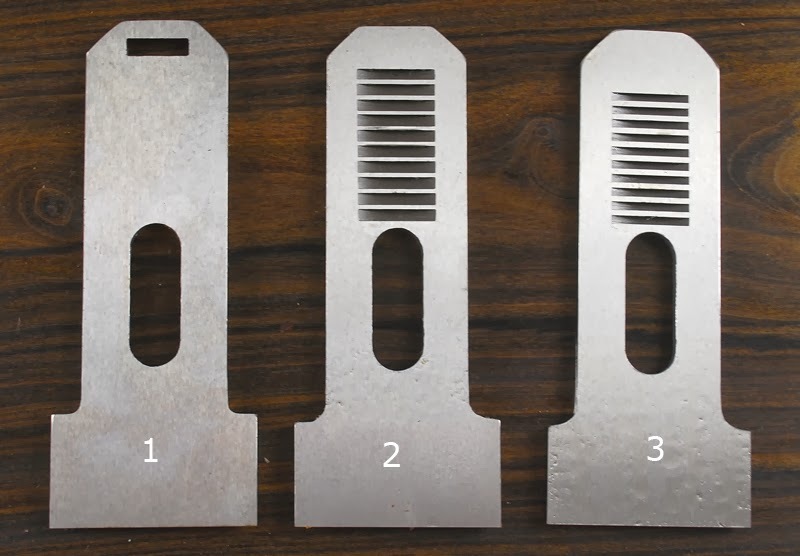 Over time the designs of QS block plane adjustment mechanisms have evolved, this post is designed as a reference so that you can select the appropriate replacement cutting iron for your plane. With a single slot through the top that engages an adjusting nut on a fixed threaded rod in the back of the plane body. The slot is 4mm wide, 14mm long and goes right the way through the blade. Also fits Lie-Nielsen block planes. Also with 10 machined grooves, but finer than a type 2. Each groove is 2mm wide, 17.5mm long, 1.7mm deep at the centre and they have 1.1mm lands between them. The total length of the grooved area is 30mm. At the time of going to press, all three types of block plane iron are available with 25, 38 or 50 degree bevels so that the pitch of the plane can be altered by simply switching the blades. Cutting irons with the same combination of bevel angles are also available for the bevel up Quangsheng 62 low angle jack plane. Quangsheng rebating block plane irons come in the same three types but are only available with a 25 degree bevel. 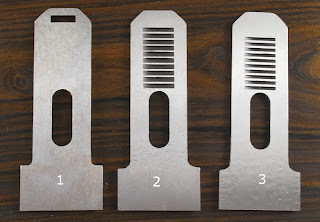 The cutting edge of the rebating versions are just a hair over 44mm wide (1-3/4") and the neck is 31mm wide. Quangsheng replacement plane irons are available in standard widths, all are 3mm (1/8") thick. The majority of older bench planes and all of the better quality new ones will take a 3mm thick iron with no problems. Depending on the vintage and manufacturer, some of the old ones may need the Y lever replacing in order to reach through the thicker iron. Installing a thick, soft, closely fitted, vibration absorbing low-profile cap iron is another way of enhancing a plane's performance. If Bailey pattern planes have an Achilles heel, the pressed steel chipbreaker is it. We have seen a few examples of more recently manufactured 'affordable planes' that no longer conform to the standard dimensions, for these 'upgrade resistant' models, a good quality thin plane iron may be the only option available. Quangsheng Type 3 Block Plane Iron also works as a replacement iron for Stanley/Record No.60, No.60-1/2 or only Type 2 Irons works? Type 2 works with Stanley/Record, Type 1 works with LN, Type 3 works with current production QS.